particularly as they will be highly iodized. The very high proportion of the roundest vintages of Pinot noir allows the absence of dosage and the small fraction of Chardonnay brings a touch of youth which will avoid heaviness. Chardonnay for a hint of youth that will prevent heaviness. No dosage. Stock in vats and cellars: approximately 4 years. too exuberant. 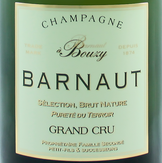 - Bouquet: complex, crystallised fruits and spices, a hint of brioche, very dense. - Palate: a wine that is both full-bodied and lively, strong -inosity typical of the Bouzy region. Lingers in the mouth expressively.